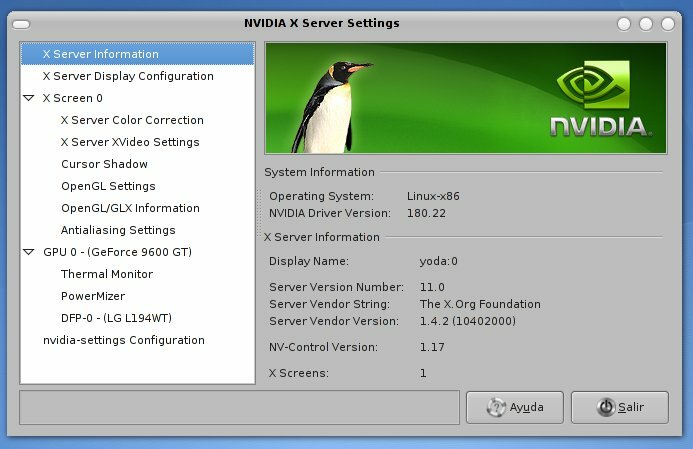 ya tenemos disponible la versión 180.22 del driver de Nvidia para Linux. Added initial support for PureVideo-like features via the new VDPAU API (see the vdpau.h header file installed with the driver). Added support for CUDA 2.1. Added preliminary support for OpenGL 3.0. Added new OpenGL workstation performance optimizations. Enabled the glyph cache by default and extended its support to all supported GPUs. Disabled shared memory X pixmaps by default; see the “AllowSHMPixmaps” option. Improved X pixmap placement on GeForce 8 series and later GPUs. Improved stability on some GeForce 8 series and newer GPUs. Fixed a regression that could result in window decoration corruption when running Compiz using Geforce 6 and 7 series GPUs. Fixed an nvidia-settings crash when xorg.conf contains Device and Screen sections but no ServerLayout section. Fixed a problem parsing the monitor sync range X config file options. Fixed a problem with the SDI sync skew controls in nvidia-settings. Fixed a problem that caused some SDI applications to hang or crash. Added support for SDI full-range color. Tenemos disponible la descarga para linux X86 aquí y para X86-64 aquí. Lo instalé siguiendo el método que os explicaba aquí en mi Debian Lenny sin problemas.